Let your heart speak through a dazzling display of blooming beauty. 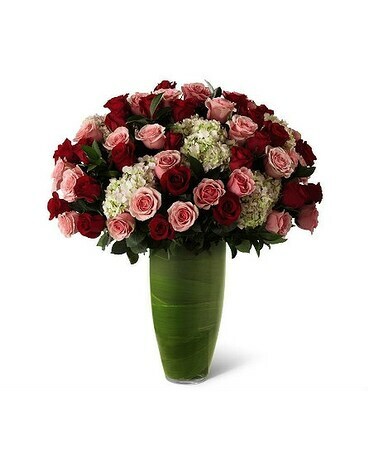 48 Stems of our finest long-stem roses in blushing shades of pink and red are offset by clouds of soft pink hydrangea, situated in a superior clear glass 14-inch bullet vase, to indulge their every sense. Includes: 24 stems of red roses, 24 stems of pink roses, and 5 stems of hydrangea.